By 1860 the fashionable shopping district of New York had migrated northward to the blocks on Broadway just south of Houston Street. The magnificent St. Nicholas Hotel engulfed the entire block between Broome and Spring Streets and upscale merchants built impressive structures to lure wealthy shoppers—Tiffany & Co. had already been at 550 Broadway for nearly a decade. It was time for Tiffany’s rival, Ball, Black & Co., to move north from 247 Broadway as well. Among other articles, the company produced and sold jewelry, silver objects, clocks, decorative furniture and chandeliers. Founded in 1810, the company was originally located at 166 Broadway and was considered the jewelry store of New York City. As its successful business grew and as commerce moved northward up Broadway, the store had changed addresses three times. Ball, Black & Co. was ready to move again. John A. May was a manufacturer of umbrellas, but he dabbled in real estate as well. In 1860 he commissioned architect John Kellum to design a building specifically for the use of Ball, Black & Co. Completed a year later, it was a six-story show-stopper of East Chester marble. Well-dressed shoppers peer into the enormous plate-glass windows in the 1860s. The store was opened on July 1, 1860 “with great splendor and éclat.” The structure was not only beautiful, but innovative. Touted as the first “absolutely fire-proof” building in New York, the vaults below street level contained the first safe deposit system in the United States. The single-sheet panes of plate glass imported for the first floor windows—14 feet, 8 inches tall and 9 feet, 2 inches wide—were thought to be the largest ever made. Certainly they were the largest ever brought to the U.S.
On the third floor could be found chandeliers and gas fixtures. Many of these were manufactured on the premises while others were imported from France and England. The top three floors housed the manufacturing and workroom spaces. Jewelry was made here, diamonds set, watches repaired and tableware was gold or silver plated. The company employed over 300 works including designers, engravers, chasers and modelers. 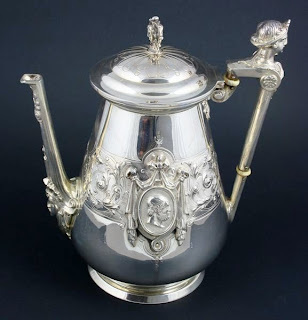 Ball, Black & Co. designed and sold handsome silver ware like this coffee pot. Certainly the promise of an end to demoralized or deranged watches must have been welcome news to 19th century travelers. Despite its flawless reputation as a quality purveyor of high-end goods, Ball, Black & Co. went out of business in 1874. By 1890 the white marble palazzo was home to Banner Brothers, wholesale clothing merchants. Banner Brothers manufactured and sold “medium and better grades” of men’s apparel, doing about $1 to $1.25 million a year; a sum amounting to about $23 million today. Within the year Banner Brothers was no longer at No. 565 Broadway. Charles and Moritz Freedman purchased the building in 1893. The area, by now, was quickly becoming the center of the dry goods industry. Manufacturers and merchants of women’s wear, they envisioned an enlargement of the small sixth floor—creating a full story now visible from street level. Instead, however, they hired architects Little & O’Connor to raise the building four full floors. The architects worked in light-colored brick, mirroring the corner quoins and the window pediments of the original structure. The resulting $50,000 addition was hardly noticeable to the casual passerby. While the Freeman brothers ran their garment business here, they leased space to other firms. 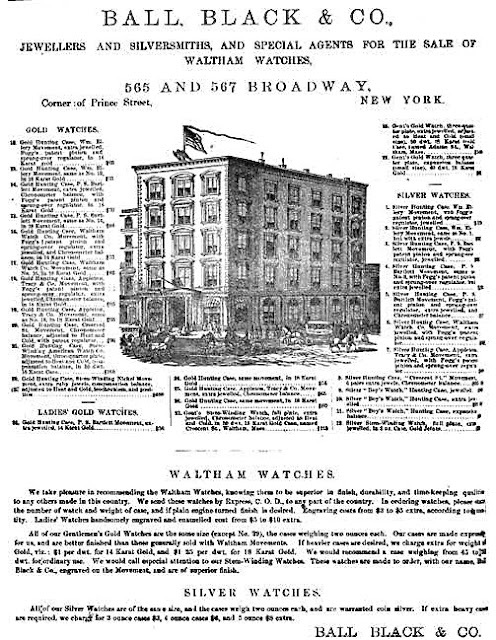 In 1899 Fred Kaufman, wholesale jewelers, moved from 41 Maiden Lane and would stay for a decade. In 1900 Herzig, Kipp & Co., manufacturers of silk undershirts was here. That same year the Freeman brothers went bankrupt. Additional dry goods firms like Abrahamson Brothers, whose headquarters was in Oakland, California, and Hollins Manufacturing Company moved in. In 1904 the street level was taken over by the Mechanics’ & Traders’ Bank as its Prince Street Branch. Apparel manufacturers continued to fill the upper floors. In 1912 Premier Notion Company was here selling collar stays; but the vast majority of tenants were women’s straw hat manufacturers. Among these were H. F. Sawyer & Co., Williamson & Sleeper, and R. Cinelli Hat Company. The bank on the first floor, now known as Metropolitan National, merged with Chase National Bank on November 22, 1921. Chase continued to refer to the location as the Prince Street Branch. Soho suffered a severe decline during the middle of the 20th century and buildings were neglected and abused. No. 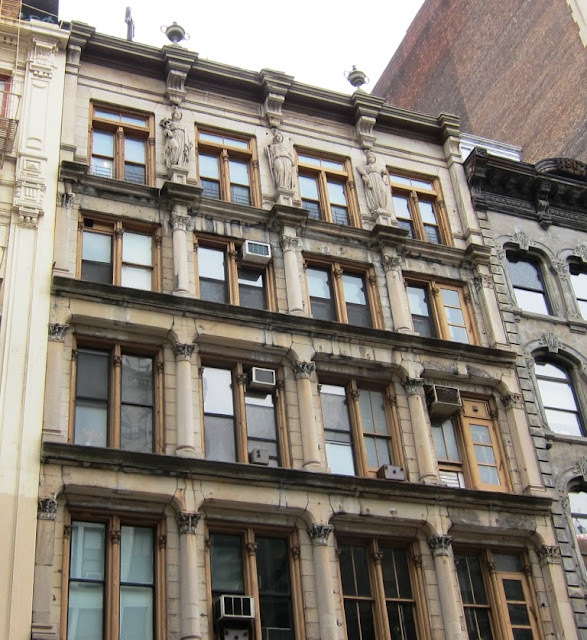 565 Broadway lost its cornice, but otherwise remained essentially unaltered despite its deteriorating marble. Then in the 1970s and 80s a renaissance occurred as artists discovered the cheap loft space with ample sunlight. Galleries filled the side streets and avenues and artist studios took over former manufacturing or warehouse space. In 1979 Martin R. Fine commissioned restoration architect Joseph Pell Lombardi to converted No. 565 to residential cooperative apartments. Schulte Galleries leased the ground floor. Today, the ground floor of No. 565 Broadway is home to a Victoria’s Secret store. Where women in voluminous hoop skirts once browsed among diamonds and silver coffee services, lacy bras and sheer negligees are displayed--a situation that might cause many a Victorian shopper to faint. 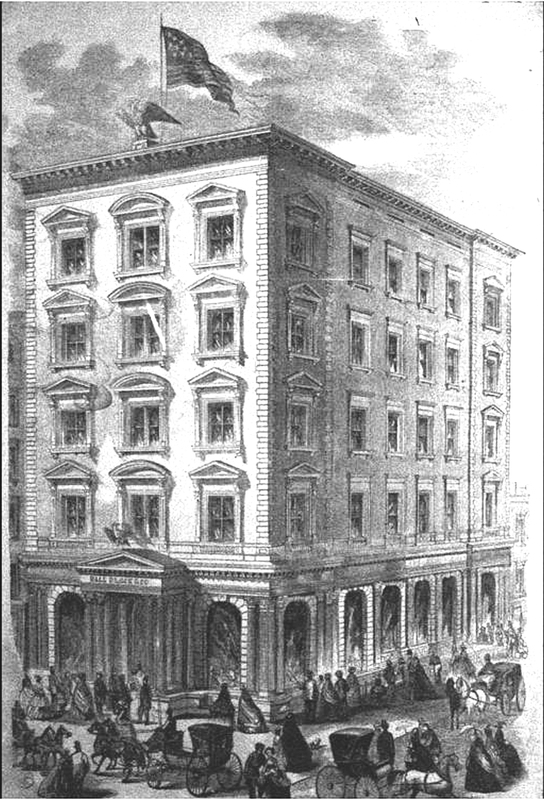 In 1864, as the Civil War still raged in the South, the stretch of Broadway from Broome Street to Prince Street was perhaps the most exclusive business district in New York. Ten years earlier the magnificent white marble St. Nicholas Hotel—touted by some as the most glorious hotel in the world—opened on the opposite side of the avenue, one block south. Commercial buildings that reflected the high-tone nature of the neighborhood rose; many with street level shops meant to attract the hotel’s wealthy clientele. One such building was erected at Nos. 542 and 544 Broadway that year. At the owner’s direction, the now-unknown architect pulled out all the stops. Six stories high, its white marble façade gleamed in the sunlight. Paired, recessed windows graced by slender colunettes were separated by rusticated piers. Corinthian columns supported a cornice at each level and above it all, five classical urns served as finials to the carved, scrolled brackets of the cornice. Three of the original cornice urns have been lost over time. It was the sixth floor, however, that made this building exceptional among its neighbors. Here three marble statues of Roman goddesses – Panaceia, Athena and Ceres—stand on paneled blocks. The sculptures stare imperially across Broadway. And because their heads clearly do not touch the cornice brackets above them, they politely decline to do the work of caryatids; preferring to be art. Meanwhile, the upper floors held small factories and offices. The American Express Company opened a branch office of its express package service here in 1871 and would remain past the turn of the century. In 1884 Frank Seaman was publishing his Dio Lewis’s Monthly here. The periodical prompted the Normal Teacher & Examiner to praise “Dio Lewis’s Monthly is the grandest Magazine we have ever seen.” In 1886 both Marsh Brothers, manufacturers of trusses, and L. Sinsheimer, tobacconist, had offices in the building. That year the successful Sinsheimer commissioned Schwarzman & Buchman to design a five-story brick cigar factory uptown at 100th Street and 3rd Avenue. By 1889 the upper floors were mostly filled with dry goods and apparel merchants. On the 5th floor was Louis Kaelter, a fur manufacturer. Other firms were The Strong Pants Manufacturing Company; Felix S. Krotz & Co., dress goods; and Brown, Draper & Co., who dealt in woolens. Eventually, the stubborn blaze was extinguished; but not before Kaelter suffered what would amount to about a quarter of a million dollars in loss by today’s standards and the firms below suffered serious water damage. At the turn of the century, although commerce was moving northward and the grand St. Nicholas Hotel had been razed, the area still supported fashionable business. The ground floor of No. 542 Broadway was home to Bernard Rice’s Sons, manufacturers and wholesale sellers of jewelry and silver goods with its own factory in Williamsburg, Brooklyn. A year earlier Bailey Restaurant had opened a small branch in the building, sharing street level with Rice’s Brothers. The popular Bailey chain now totaled six restaurants throughout Manhattan; but its move into the classy building at No. 542 Broadway would prove to be a mistake. In the meantime, dry goods companies continued to lease space in the upper floors as the neighborhood changed. In 1904 Daniel Strauss ran his chiffons factory here. The building underwent a series of quick turnovers in 1909 when Philip Livingston sold it in January to the Fort Washington Syndicate. The firm quickly resold it in March to Max Wolf. The newspaper reported that “because she longed for luxuries which her salary as a stenographer was not sufficient to buy,” she was “led astray.” By “led astray,” The Times meant that she had forged $9,000 in checks against her employer. At her hearing before Judge Crain in General Sessions, a character witness appeared. Catherine Bement Davis testified that “she did not believe that Miss Cohen was a criminal in the true sense of the word.” As head of the Bedford Reformatory, Miss Davis knew Harriet because she had been sent there three years earlier for forgery. Apparently Harriet Cohen’s love for the opera and costly clothes stretched back a few years. As the 20th century ground on, Broadway in the Spring Street neighborhood was no longer the stylish area of the 1860s. The building was foreclosed in 1938 and sold by the Emigrant Industrial Savings Bank to Philip Kunick, president of 542 Broadway, Inc. By now the building was “in the center of the dry goods district,” as The Times put it and the Mutual Suspender Company was doing business here. It was about this time that the first two floors were stripped of their white marble and Corinthian columns and given an industrial, pseudo-modern makeover. A mid-20th century makeover stripped the marble facade from the first two floors. The Soho neighborhood underwent a serious period of neglect before being rediscovered in the late 20th century. Then artists began filling the vast loft spaces, attracted by the ample light and cheap rents. Galleries appeared in cast iron warehouses and trendy shops took over retail spaces. In 1981 No. 542-544 Broadway, from the second floor upward, was converted to “joint living work quarters for artists in residence.” Today a clothing store occupies the street level where Rice’s Brothers once sold silver-plated smoker’s sets, and suspender and pants factories are now chic apartments. 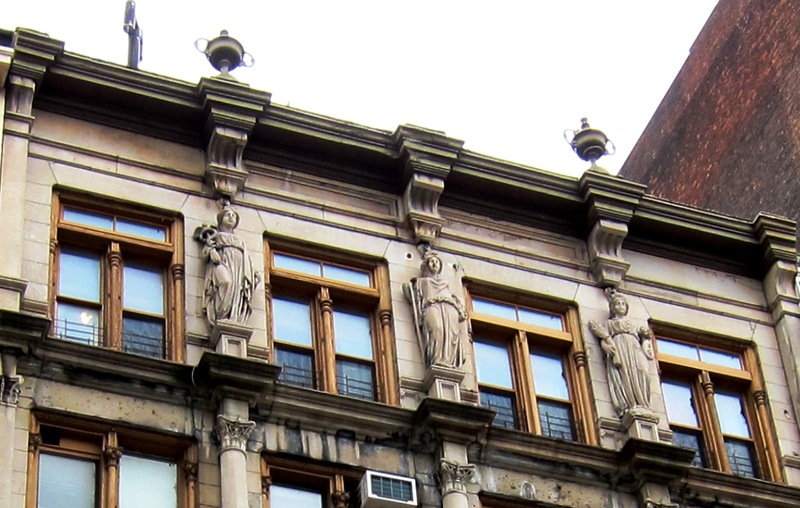 And above it all, three marble maidens—silent witnesses to nearly 150 years of New York history--stare aloofly across Broadway. The Ultimate Family Feud -- The Lost Astor Houses 5th Avenue and 34th St. In 1827 William Astor, son of the original John Jacob Astor, purchased half of John Thompson’s farm north of the city. It was a prodigious investment, as things would turn out. Within a few decades Astor’s section of the land would become Fifth Avenue from 32nd Street to 35th Street; the most prestigious residential district in the United States. Although William, who had the unfortunate and sometimes socially embarrassing middle name of Backhouse, erected a small brick dwelling at the corner of Fifth Avenue and 34th Street, the family remained on elegant Lafayette Street. Upon his death, the Fifth Avenue property was passed to his sons, William Backhouse Astor, Jr. and John Jacob Astor III. The two brothers would erect grand brownstone mansions, separated by a garden, at Nos. 338 and 350 Fifth Avenue. It seemed that only a garden could come between the millionaire brothers. But then there was the matter of the wives. John married Charlotte Augusta Gibbes in 1847 in Trinity Church. Known as Augusta, she brought a sterling pedigree to the marriage that included a string of titled ancestors including King John. Intelligent and educated, she included on her guest lists writers and painters and even an actress or actor. Although she might entertain one or two hundred guests in the expansive ballroom and dazzle with dripping jewels and pearls; her main focus was on charities. She was a driving force in the new Children’s Aid Society. In the meantime William B. Astor married Caroline Webster Schermerhorn, the stout and snobbish daughter of a millionaire merchant. Caroline’s roots went back to the original Dutch patroons, thereby providing her with social bragging rights. The 22-year old bride was ambitious and determined and one of her first acts was to insist that her husband drop his “vulgar” middle name. 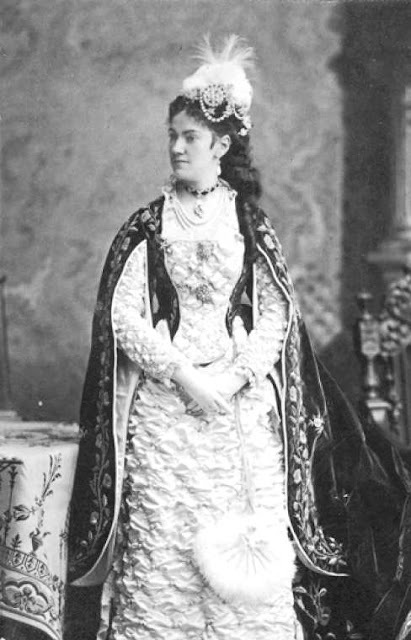 Caroline Webster Schermerhorn Astor in 1875, dressed for a ball. The opinionated and determined socialite demanded to be THE Mrs. Astor. Eventually, although the couple managed to have five children, William would spend little time in the mansion; preferring to while life away on his enormous yacht far from his wife’s demands and parties. The sisters-in-law whose houses shared the block could not have been more different. Caroline vocally admonished Augusta’s mixing with those beneath her social station and could not understand her obsession with charity. Yet her heart was not all steel and ice. On a Friday afternoon in September 1884, Caroline Astor sat looking out the window onto Fifth Avenue. There, toiling in the heat was a gang of ditch diggers excavating for the soon-to-come steam pipes of the New York Steam Heating Company. Recalling that they had been working the entire week and seeing the perspiration on their faces, she summoned her butler and asked him to bring the foreman to her. As she watched from the window again, over one hundred men filed up to the butler who deposited a dollar coin in their hands. One worker who attempted to take his place in line twice was caught by the foreman and fired. It was, however, an apparently rare act of overt kindness. Unlike Augusta's, Caroline Astor’s guest list was stringently restricted. No Jews or Catholics were invited to her ballroom or dining room. One story tells of the time that August Belmont threatened to capsize the financial community if he and his wife were not issued an invitation to an upcoming ball. Under pressure, Caroline sent the invitation. When Mr. and Mrs. Belmont arrived at the Astor house, they were the only guests. Indeed, the ball that The Times anticipated was impressive. The floors groaned under the weight of the flowers and potted plants. Caroline Astor received her guests in the drawing room under her full-length portrait as they proceeded to the ballroom. After the dancing, the party ate from gold-plated dinnerware. Now the war was officially on. Although Caroline Astor’s stubborn tenacity ended in her keeping the title “Mrs. Astor,” her nephew would deal the deciding blow in the battle. Before leaving the United States to live in England, William razed his father’s grand mansion. After briefly toying with the idea of building a stables next to Caroline Astor’s mansion, he constructed the hulking Waldorf Hotel in 1893. Designed by Henry J. Hardenbergh, it diminished Mrs. Astor’s house and forced her to share the block with travelers and businessmen. After the nerve-racking construction that shook her staid home was completed, the avenue in front of her house was filled with noisy carriages and hansoms and the sidewalk bustled with rushing travelers. Caroline Astor attempted to stay on and did so for a year. Perhaps the last straw, however, was when a transient (called by the newspapers “a tramp”) named Garvin sneaked into the 34th Street servants’ entrance in November 1894, found a comfortable bed in a laundress’s room, removed his clothing and went to sleep. The invasion of the homeless man into Mrs. Astor’s house was fodder for the press for days. When he was let go, Caroline’s son John Jacob Astor IV demanded that he be re-arrested and fined or imprisoned. The backlash against the injustice was formidable and Astor’s reputation among regular citizens was tainted. 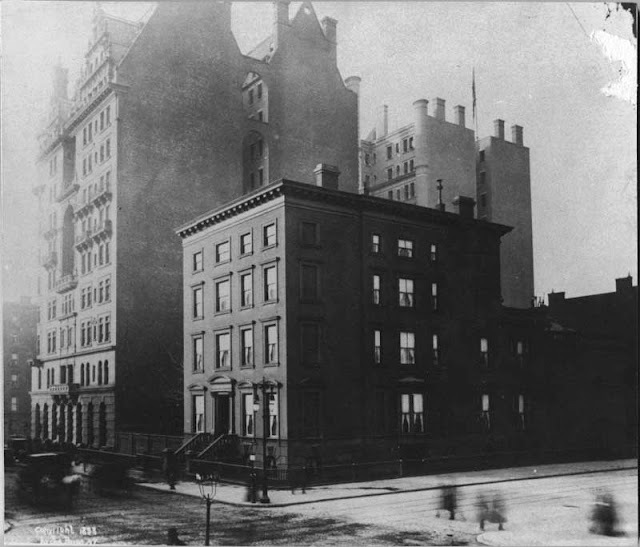 On November 4, 1894 The New York Times reported “The announcement that a huge hotel is projected for the southwest corner of Fifth Avenue and Thirty-fourth Street has been received without surprise. Before long, “Jack” Astor had constructed a sprawling double French mansion uptown for his mother and himself. 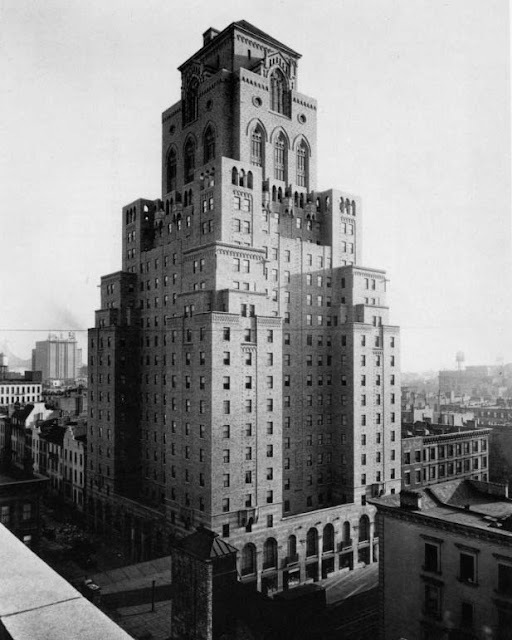 The venerable mansion built by his father came down, to be replaced by another Henry J. Hardenbergh hotel, The Astoria. The cousins swallowed their pride in favor of business interests and joined the two magnificent structures by a common walkway. The conspicuous display of wealth that strutted back and forth along this hallway earned its nickname of Peacock Alley. The combined Waldorf-Astoria Hotel was, ironically, where the investigation into the sinking of the H.M.S. Titanic was held in 1912. John Jacob Astor IV died on that fateful voyage. The Waldorf-Astoria sat on the site of the Astor mansions for only a few decades; demolished in 1930 to make way for the 102-floor Art Deco masterpiece, the Empire State Building. The Astor mansions, once the center of New York City social life and victims of family feuding, are now mainly forgotten. By the time the 1920s roared into Manhattan, women had gained a great deal of independence. Female workers were no longer solely nurses, cooks or household help. There were jobs to be found in the offices of soaring skyscrapers. It was an exciting time for the modern woman. But there were dangers in the big city as well--dangers called “wolves;” the smooth-talking decadent men who searched out naïve young girls. Girls needed protection and they found it at the Barbizon Hotel for Women. It was a sanctuary where stringent codes of conduct and dress were enforced. Girls applying for residence were required to submit three letters of reference. There were no men allowed above the lobby level and chaperones were available at parents’ requests. Designed by Palmer H. Ogden, the hulking hotel replaced the magnificent Temple Rodeph Sholom at the corner of East 63rd Street and Lexington Avenue. Ogden dipped into his historical grab bag to meld Italian Renaissance, Islamic and Gothic styles into a harmonious whole. 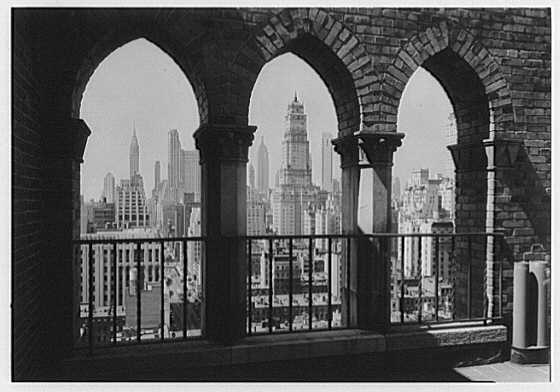 Numerous set-backs, required by the 1916 building law, created a 23-story ziggurat with arcades, balconies and colorful brickwork; all rising to a monumental central tower with three-story Gothic windows. 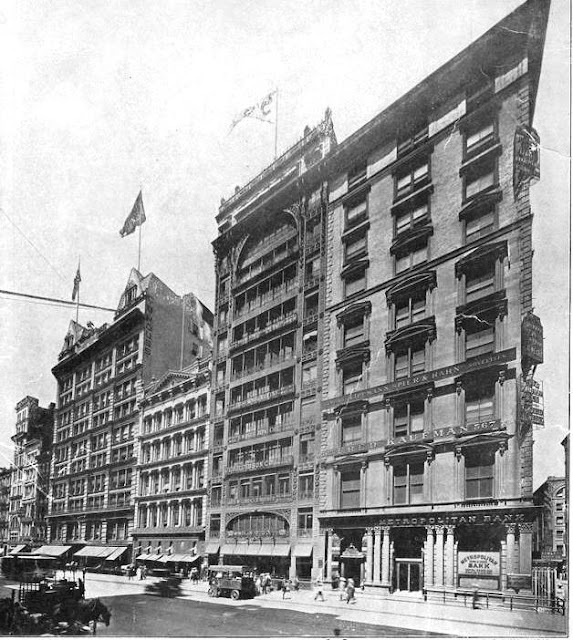 The Barbizon became the most exclusive and glamorous address in New York for young women. Most of the 700 rooms were dorm-sized quarters intended for girls on a budget. But the tenant list would include an array of soon-to-become-famous names; among them budding actresses Cloris Leachman, Joan Crawford, Candice Bergan, Ali McGraw, and Grace Kelly. 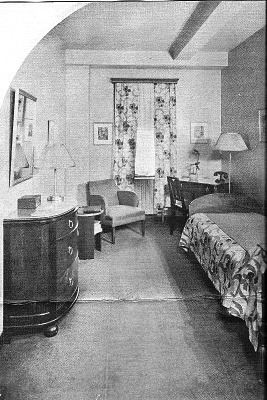 Writer Sylvia Plath lived here, later setting part of The Bell Jar at a residence hotel based on the Barbizon. Liza Minelli, Cybill Shepherd, Candice Bergen, Dorothy McGuire, Peggy Cass and Barbara Bel Geddes called the Barbizon home, along with a seemingly endless list of others. In 1931, amid the throngs of beautiful starlets, college girls and young professional women, an aging and lonely Margaret Brown—better known as Molly to posterity--appeared. The self-reliant Titanic survivor was working as an actress and had lost most of her fortune to her children in an ugly court battle over J. J. Brown’s estate. 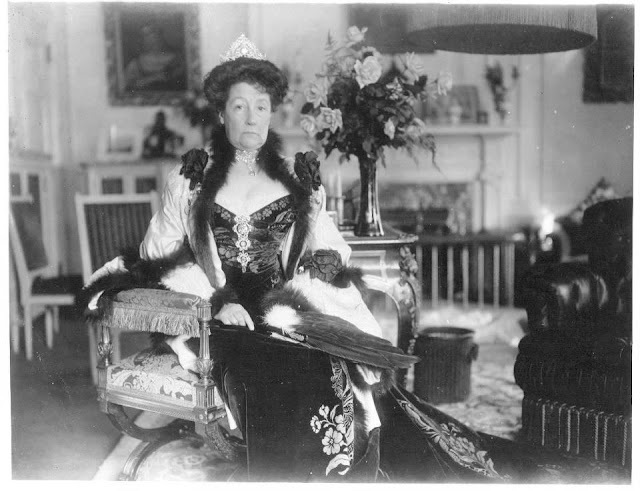 On October 26, 1932 the 65-year old Molly Brown died in her room at the Barbizon of a brain tumor. Among the glamorous models who “couldn’t get out” were Delores Hawkins, Gloria Barnes and Jean Patchett. Following suit, the Katharine Gibbs Secretarial School used the Barbizon for the safe-keeping of its Gal Fridays-to-be. The Barbizon Hotel for Women was not all about young actresses who became movie stars and professional girls who met and married millionaires. There was tragedy at the Barbizon for those girls who did not quite succeed. Judith Ann Palmer was brought to the hotel by her wealthy mother, Mrs. Philip O. Palmer of Chicago on January 22, 1939. On July 8 the 22-year old placed $30 in a dresser drawer and wrote a note saying the money should cover her funeral expenses. She then wrote and note to her mother; then, dressed in her negligee, she shot a bullet into her right temple. In 1957 Gael Greene, writer for the New York Post, wrote a series of articles exposing the heart-breaking existence of the girls whose lives fell short of glamor and instead were filled with loneliness and fear. By the 1960s the reason for the existence of the Barbizon Hotel for Women was essentially gone. After several owners, it became the Melrose Hotel in 2002 following a $40 million renovation. The 700 small rooms were no more, now about half that many. Then only three years later developers purchased the Melrose, converting it into luxury condominiums and switching the name back to The Baribizon. The enormous hotel, where Betsey Johnson and Gene Tierney once slept in tiny rooms, now boasts just 66 sprawling apartments that the likes of Ricky Gervais call home. While little of the original interiors are left, the exterior of the Barbizon is essentially intact--a wonderful example of 1920s eclectic architecture and a most interesting page of women’s social history. Stuyvesant Fish, son of Hamilton Fish, came from one of the oldest and most prestigious families of New York. Although his time was mainly taken up in the railroad industry, he was also involved with financial and insurance institutions such as the National Park Bank and the Mutual Life Insurance Company. It was his wife, the former Marian G. Anthon, however, who stole the spotlight in the Fish household. Mamie Fish, as she was known to her friends, was not your typical society hostess. Her down-to-earth sense of humor and her love of tongue-in-cheek and memorable entertainments made her a contemporary legend. 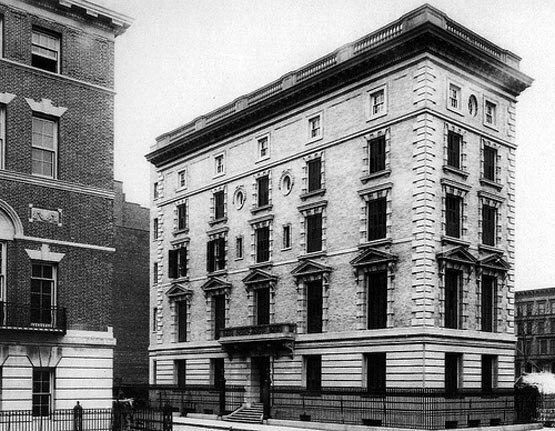 The Fishes moved into 28 East 56th Street, then took over the old brownstone mansion at 19 Gramercy Park in 1887 which Mamie updated (the address was actually 86 Irving Place; but Mamie had the addressed changed to the more socially-acceptable Gramercy Park). While the Astors and Vanderbilts were building mansions along the more conspicuous Fifth Avenue, the Fishes lived more privately, if not quietly, on the somewhat secluded park. Then as the 20th century approached, the Fishes moved uptown. Still eschewing Fifth Avenue, they commissioned Stanford White to produce a five-story Italian palazzo at the corner of Madison Avenue and 78th Street. The hostess went out of her way to avoid the stuffiness of society gatherings. She sent invitations to a dinner in honor of the visiting Prince del Drago, only to shock and then amuse her diamond-and-pearl draped guests when they realized the prince was a monkey. The press adored her. She continuously provided fodder for an amusing article. On October 11, 1902, The Evening World wrote of her new “pet bee.” When Mrs. Stuyvesant returned from Hot Springs, she was sent a miniature automobile filled with flowers. “As she scented the fragrant blossoms she heard a buzzing and then from the heart of a purple orchid there crept this bumblebee. Mrs. Fish didn’t scream,” the paper reported. Because of Mamie Fish’s extraordinary sense of humor, the minor incident became a tongue-in-cheek story in which she, no doubt, had no small part in publicizing. It was just one more way that Mamie Stuyvesant warned New York society not to take itself too seriously. The following morning the newspapers announced that the “new dances” were a great hit with Mrs. Stuyvesant’s guests. In 1914 Frederick Vanderbilt invited the Duke and Duchess of Manchester to tour South America on his yacht, the Warrior. The craft, however, wrecked and the wealthy party had to be rescued and brought back to New York on a steamer. The following day The New York Times added that “The dinner was followed by monologues and exhibitions of fancy dancing.” One trusts that the diversions helped the Duke and Duchess to forget their ordeal. An older Mamie Fish was dressed for a ball. Stuyvesant Fish lived out his life at No. 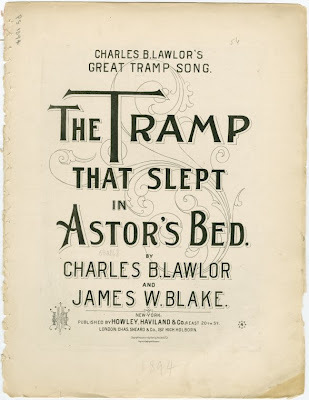 25 East 78th Street; but the grand entertainments were over. He died in 1923 and the following February an auction of the Stuyvesant art and furnishings was held on premises. In the sale were Brussels tapestries, a carved and gilt Louis XVI parlor suite with Aubusson tapestry upholstery, marble statuary, and Italian Renaissance dining room suite, early Italian paintings and Mrs. Fish’s silver. 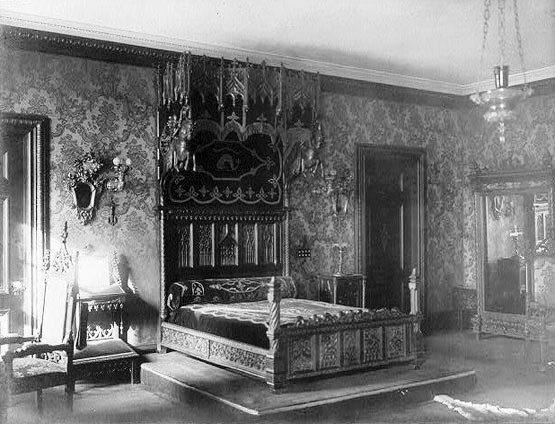 The remarkable Gothic revival bed in Mr. Fish’s bedroom sold for $275—about $3,000 today. The house was briefly used as office space; in 1930 Formes, a French periodical on modern art had its English edition editorial offices here. Then in the 1940s it became home to the private Walt Whitman School. The house sold again, in 2006, to the Bloomberg Family Foundation, headed by Michael R. Bloomberg. The price had risen to $45 million. Despite the unforgivable destruction of the interiors, the Stuyvesant Fish house remains one of the grandest of Madison Avenue survivors. 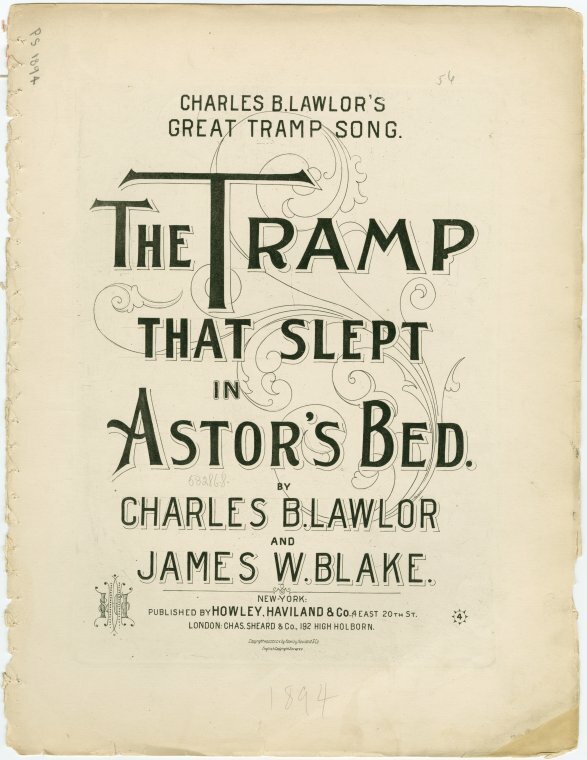 And the wife of its original owner was one of the most interesting characters of New York social history.